You asked and we are delivering… SolarTrak just added a mileage tracking option with IFTA fuel tax compliance functions. Now you can track vehicle mileage or use the “Replay a Day” function and check speed at any point on the trip. Your repair crew will love the ability to get maintenance reminders based on mileage. Plus, get a “Mileage by State” report for easy compliance to IFTA Fuel Tax reporting requirements. 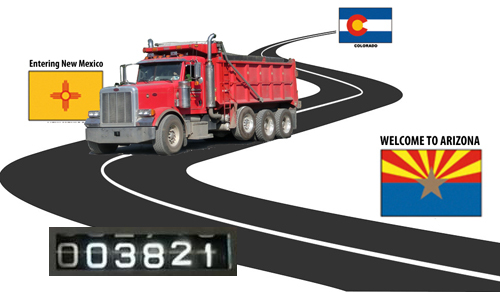 It shows each piece of equipment and the mileage it traveled in each state, making it easy to calculate fuel taxes. For customers with mixed vehicle and equipment fleets, we’ve priced the license separately so you can add the Mileage option to only the vehicles that need this function. The price? For those renting trackers, its $2.50 per month per tracker. If you buy a tracker, add $150. Quite affordable. Super useful. Talk to your SolarTrak rep about adding the Mileage feature. No sales rep? No problem. Call 484-223-4994, and we can fix that, too.